The fourth Tokamak Plasma Meeting and the third Oxygen Gathering will take place in Nuremberg, Germany on February 19th to 26th. 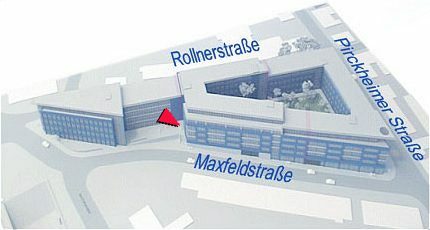 We will be hosted by Novell in the openSUSE offices in Nuremberg. The community space includes a large meeting room with AV infrastructure, a cafe-style area and a hacking bar. And of course you benefit from being only metres away from the KDE SVN server. You can check in at any time, and there is free wifi in the reception area and most rooms. Tokamak 4 Location Map shows where things are. Note that the accommodation for the first 2 nights (Friday and Saturday) is not the same as for the rest of the week. Local services are marked on the map above. For anything specific, ask Will. Nuremberg is easily reachable by air or by train. The nearest airports for intercontinental flights are Frankfurt and Munich, and Nuremberg is served from other European hubs such as Paris Charles De Gaulle and Amsterdam. Nuremberg is only a few hours by train from most of the rest of central Europe. You can reach the SUSE office in 6 minutes by tram from the rail station by taking the number 8 tram towards 'Thon' from the tram interchange in front of the railway station, follow the square 'Tram' signs. Alight at 'Maxfeldstr' as shown on the signs inside the tram and go to the SUSE office at Maxfeldstr. 5. From the airport, a taxi will cost 10-14 EUR and takes about 10 minutes. Alternatively, take the U2 metro from outside Arrivals (any train), alight at 'Rennweg', leave the station by the south exit (in the direction of travel, go to the tram stop in the middle of the road on your right as you exit the metro, and get the number 8 tram towards 'Thon' as above. Nuernberg has a pretty good general public transport information site that covers bus, tram, local trains and underground/metro with some info in English: Nuernberg public transport information. A single journey costs 2EUR, a 10er strip costs 9.20EUR. Buy tickets from multilingual touchscreen vending machines before you get on the bus/tram/underground, and single tickets are already validates. A 10er strip needs stamping, 2 units per single journey for an adult. Get the 32 bus towards Thon, get off at Thon (last stop). Then get the 26 bus towards Berufsförderungswerk (last stop). This drops you at the entrance to the BFW, take the side entrance to the Gaestehaus. Get the 26 bus towards Thon, get off at Thon (last stop). Then get the 32 bus towards Flughafen (the airport, the last stop). Get the 26 bus towards Thon, get off at Thon (last stop). Then get the 9 tram towards Doku-Zentrum. Get off at Maxfeldstr. The SUSE building is the large blue building on the right. Get the 9 Tram towards Thon, get off at Thon (last stop). Then get the 26 bus towards Berufsförderungswerk (last stop). This drops you at the entrance to the BFW, take the side entrance to the Gaestehaus. Get the U2 Underground (only one direction, Röthenbach). Get off at Opernhaus. Walk to Weidenkellerstr. 4 (see map above and hotel website). Walk to Opernhaus underground, get the U2 Underground toward Flughafen (every 2nd train goes to the airport and have an aeroplane symbol on the destination board). Get the 9 Tram towards Doku-Zentrum, change at Hauptbahnhof, get the U2 towards Röthenbach, get off at Opernhaus. You have a navi, right? Or see the Novell directions. Address above, you can park in the basement garage, we'll get you a guest pass if you come to the office within opening hours, otherwise let Will know in advance. Lukas Appelhans l.appelhans@gmx.de 19. - 18:24 21. - 17:33 ~150€ yes yes whatever Quicklaunch-Applet, KGet-Applets, Shaman/Aqpm-Applets, Raptor? For presentations a video camera would be nice, preferably with a remote microphone. (available in openSuse offices?). (It would be wonderful for those of us that cannot attend, so don't please don't forget us ;-) -sreich). We will be focusing on the KDE SC 4.5 release of Plasma, with a particular attention on feature completion, polishing and quality improvements across the code base. Activities and Plasma Mobile will also be topics of interest. Oxygen, finishing it up for 4.5 plans for the future. Oxygen what it was, what it will be? Containment, Wallpaper, Mouse Action scripting? Starting on day two we will split up into small groups to focus on specific topics and challenges. The breakout group tracks will start with short presentations designed to share important information about the topic of interest to get everybody up to speed. A schedule for each of the presentations will be posted closer to the start of Tokamak 4. Some people will stay with a specific track for the duration of Tokamak 4, but everyone is welcome to drift between the different breakout groups to bring their needs and ideas to bear. Plasma shells on devices with small screens and designed for mobility. The focus use case will be touch screen driven smartphones. Desktop themes, widgets styles, window decorations, icons, coherent branding, sites, Plasma panels, how can we clean them? What is next? Helium? Fixing kde app's UI's one by one? The present and future of the window manager component of the KDE Workspace. Areas In Which Plasma Desktop Should Get Out of the Way and KWin Should Step In, Aaron, Day ? Thursday - End of Tokamak party at Downtown? On Saturday we'll also plan the presentations, If there will be enough interests some talks could be redone/improvised for the public. On Monday, we'll have an Open Evening at Tokamak. Visitors are welcome to join us that evening for presentations. See openSUSE News for details. This page was last modified on 21 February 2010, at 21:46. Content is available under Creative Commons License SA 4.0 unless otherwise noted.